This severus snape photo contains arenque atlántico, clupea harengus harengus, arenques atlánticos, sardina, sardinops caerulea, sardina pacífica, sardina del pacífico sardinops caerulea, arenque, clupea harangus, and arenque clupea harangus. There might also be marlín, pez espada, spearfish, pez espada, xiphias gladius, peces de pico, pez aguja, and marlines. The actor playing Dumbledore is the great Richard Harris, he died shortly after the movie was shot, playing Dumbledore was his last part. 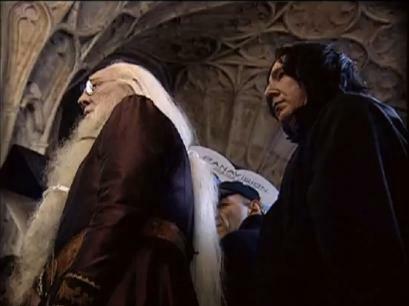 Albus : "Be careful, Severus, not to tread on my hair, will you ?" Severus : "I'll do my best, Headmaster." "The actor playing Dumbledore is the great Richard Harris, he died shortly after the movie was shot, playing Dumbledore was his last part." LN, thank you for reminding people of that fact. Too many seem to forget it, and in my opinion, the role of Albus Dumbledore was his greatest.